Written by Kristin Pitzer on 09 April 2017 . 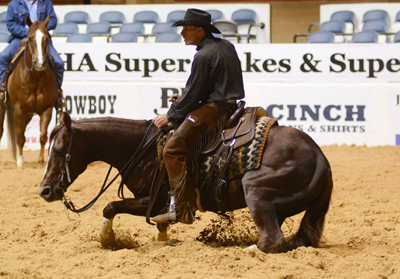 During the National Cutting Horse Association (NCHA) Super Stakes Limited Open finals, held on April 9 following the end of the Open second go, 16 determined horse-and-rider teams vied for top honors and a $7,420 paycheck. Out of the first hole, Johnny English carried Rowdy Larson to a 222, a score that could not be touched through the rest of the finals. Larson himself came the closest to it when he rode back into the herd on Metallic Ina and marked a 217, which earned the Reserve Championship and $6,712 for owner/breeder The Over Forty Ranch. Johnny English (out of Turtle Pie x Son Ofa Doc) was bred by Crown Ranch LP, of Weatherford, Texas, and is owned by Nick Meagher, of Antonita, Colorado. The stallion and Metallic Ina (out of Hickory Badger Ina x Doc’s Hickory) are both by Equi-Stat Elite $11 Million Sire Metallic Cat. “Johnny’s” lifetime earnings now stand at $21,670, while Metallic Ina’s are approaching $23,000. Larson’s bankroll pushed past the $300,000 marker.